Tangy Lemon fragrance. Free from acids or caustics. Rapid action cuts through grease and grime. 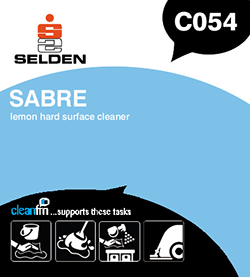 Effective maintenance cleaner for all hard surfaces. Low foam reduces cleaning time. For general cleaning dilute 1 part 'Sabre' to 40 parts hot water. For damp mopping dilute ‘Sabre’ 1 part to 80 parts warm or cold water.